If you are a member of the trade or media and have been added to our database and have received emails from us, you may click the image to the left to access trade information and events. If you are a member of the trade and are not in our database and wish to be included, click the image to the left and complete the mailing list form. Once your trade status is verified, you will be able to access our events and trade information pages. 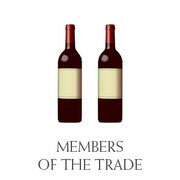 Thank you for your interest in Oakville Winegrowers. Click here for a list of upcoming trade events.